My heart is with indie games. They are constrained by smaller budgets, but they also have more freedom. They capitalize on popular gaming trends in ways that advance genres in new and interesting ways. One such game, Minecraft, is independent in spirit, but played by literally millions of people around the world. 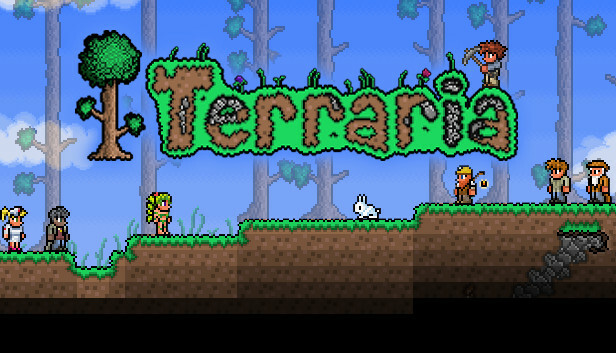 It can be played by a single player or by several players connected on one of any number of servers. World building games may be the first games humans play. We explore to carve out physical niches for ourselves in the world. We climb trees, we explore ditches and tunnels, and we build forts. We get LEGO sets and immediately set out constructing a universe from blocks. There is a universal appeal to building things from scratch and then inhabiting and exploring them, taking pride in our accomplishments and sharing them with others. Minecraft is one such video game. It is a sandbox construction set written entirely in Java. It is available for PC and Mac, and as as a mobile app (although that version admittedly needs a bit more work). It can be played in a browser or in a downloadable client shell. Minecraft is all about taking blocks and building things from them to shape an entire world. It's like a LEGO set* where you are placed in an immersive, three-dimensional world and have the freedom to craft virtually any item and construct virtually any building you can imagine. It's phenomenally fun. It's also free, although I encourage anyone with a passing interest in building things to go out and buy the much more robust 'full version' of the game. 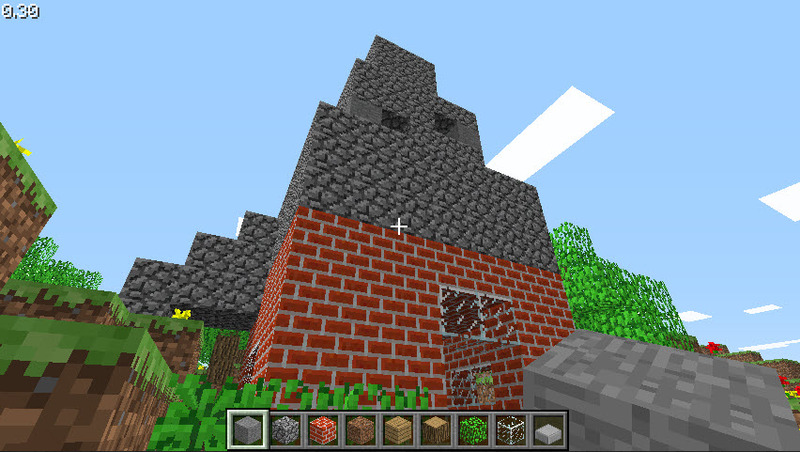 Read Minecraft's Wikipedia entry for the history and facts. Minecraft has a distinctively crude visual style, one marked by low res textures and, of course, the ubiquitous blocks, so it's really amazing just how many things people have come up with. There are full cities, sprawling murals, and meticulous recreations of real world structures. You can play on your own or with others. 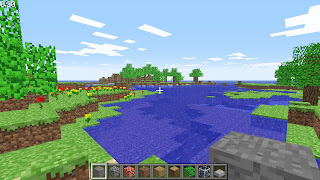 You can play with unlimited resources, or you can collect elements like wood, stone, coal, water and dirt to create amazing objects which can then be used to craft even more items and objects. It's like any great game - easy to learn, but difficult to master. Upon entering our world, which is randomly generated, we are met with a stunning (albeit blocky) vista: a beautiful inlet, green and sandy shores with wispy white clouds overhead and yellow and red flowers all over the ground. This shoreline is the perfect place for a house. 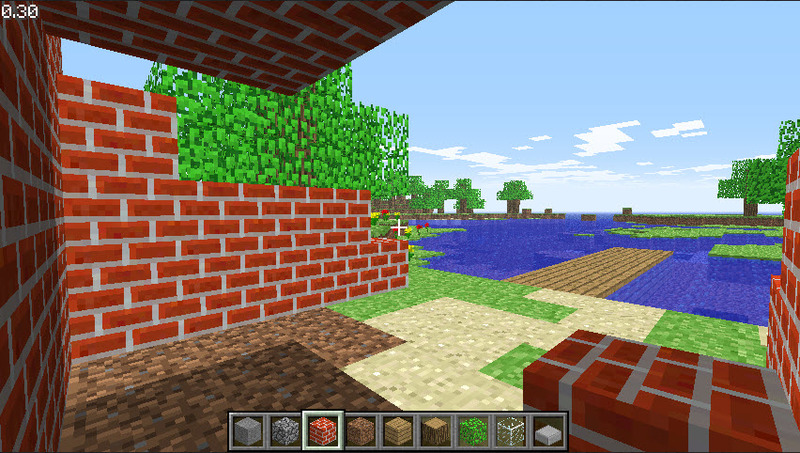 Next, unlimited creation mode allows us to choose the type of block we want to build with. 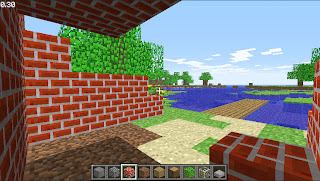 We have dirt, stone, mortar, brick, foliage, wood and wood planks, glass, and many others available in another sub-menu. 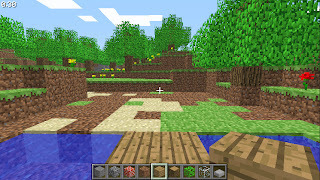 Remember - in creation mode, we have free reign of our environment, but in many other modes, we must actually retrieve wood from the trees, dirt from the ground, and ore from stone in order to craft tools that make elemental extraction easier. The interaction and fluidity between the elements, and the myriad items that can be crafted from them, is one of Minecraft's great joys. Let's start by building a little dock on the water. See? Easy! The creation of items is limited to where you can go. For instance, you cannot build a long wall hundreds of meters in front of you with a wave of your hand. Instead, you must be near the spaces where you place the blocks. This gives you a sense of real immersion, so that you feel you are doing all the building yourself. Look at the picture above. I've decided I want to build a little house, but the shoreline is awfully rocky and uninhabitable. I think I need to bulldoze through some of that dirt, and maybe even do a little clear-cutting. There. Much better. Time to start work on the house. I think it should be made of brick, just in case any big bad wolves decide to come snooping around. The trick here is to plan out your dimensions in advance, so what you create doesn't end up looking like a haphazard assembly of blocks, but instead a virtual structure with aesthetic integrity. Onward! Ready to see the completed house? Isn't that special? If you look closely you can see windows on the side of the structure as well, and a little chimney sticking out of the roof. 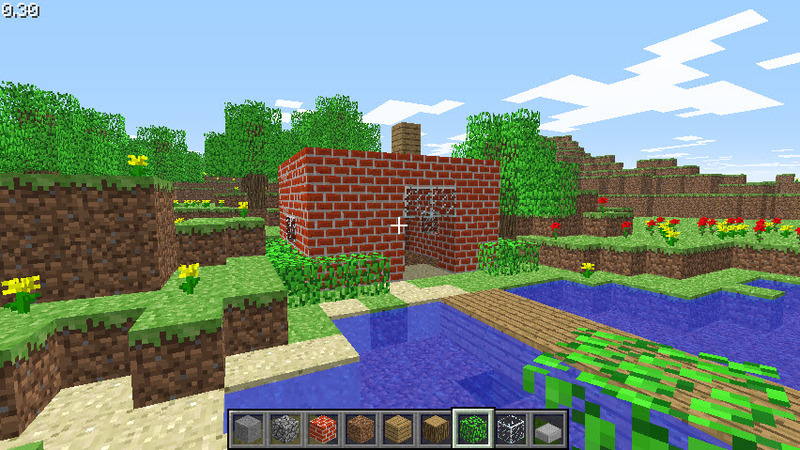 I added some bushes around the side of the building, but overall, I've kept it simple. 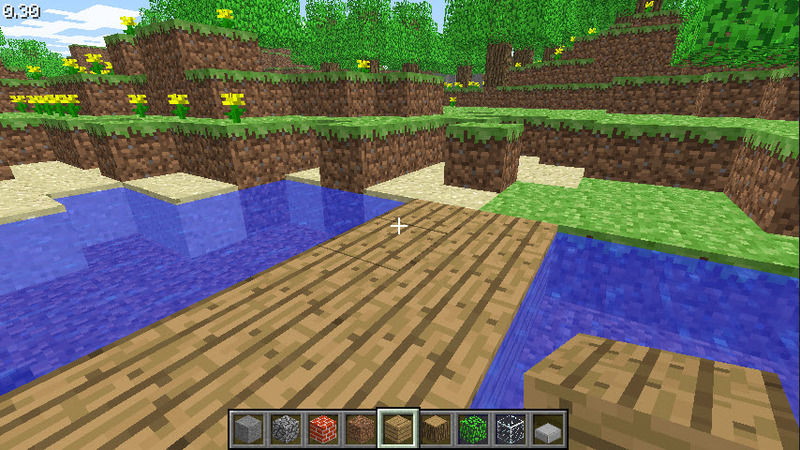 In Minecraft, you can do away with any existing blocks you can reach. If you want, you can dig deep into the ground. You can make pits, or caves. Many of Minecraft's underground caves are already there, so if you dig a few meters into the earth, you might find yourself in a labyrinthine series of stone and dirt rooms. Or, you can dig them out yourself. Just be careful not to dig too deep. There be lava down there! For now, I'm not interested in digging down. I want to go higher. I want a tower. Let's add an extension onto the house to turn it into an Orthanc-style tower. It will be like the Orcs took over. Nice! Now that's cool. If you want, you can build a spiral staircase inside your structure, or, if you're pressed for time, you can just build a makeshift staircase as I did (look to the left of the brick structure to see it). Unfortunately, you can't build to a limitless height, but you can build awfully high, right up to where the clouds are. I've build a tower to the limit and stood looking down, and it gives me vertigo. I know it's hard to make out from the picture, but the clouds are pretty danged high. From here, the possibilities are virtually endless. 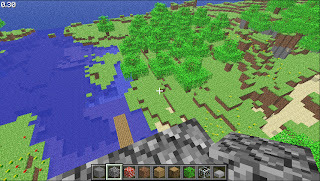 Minecraft's creator, Markus Perrson (also known as Notch) is an avid gamer. He understands that after a while, the player may exhaust their exploration of what can be built in-game. With this in mind, there are other, more challenging modes available, and, of course the UGC (user-generated content) community is always growing, and always coming up with new things to do and play around with. I'd like to think that the respect afforded develops like Notch (and his company, Mojang) has in no small way really helped independent producers escape the yolk of big publishing houses. 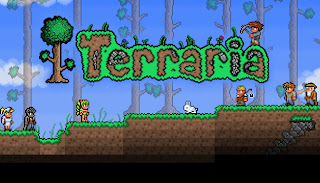 Terraria is the two-dimensional, pixel art equivalent of Minecraft. Many of the same rules apply. 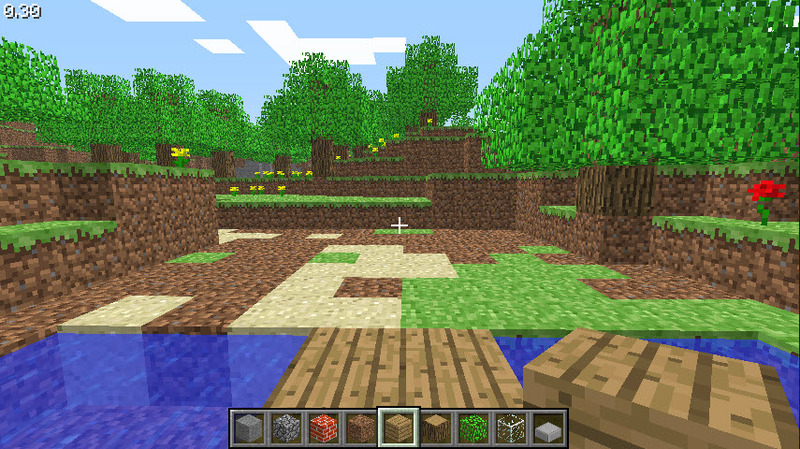 You craft items, build shelter from monsters, play with the elements, and - just like Minecraft - there is a multiplayer element. Steam often sells this one for under $5. I hope you enjoyed this little tour of virtual world building and crafting games. I don't have the time to sit down and create anything resplendent in Minecraft, but what little time I do spend with it is always fun, and always addictive. *An official LEGO/Minecraft set has recently been confirmed. **(Schaffer's Double-Fine Productions, it should be added, has raised Kickstart funding in excess of (as of this publication) 1.5 million dollars in support of a new independently produced point and click adventure game.